President Ferdinand E. Marcos signed Proclamation No. 1081 on September 21, 1972, placing the Philippines under Martial Law. Some sources say that Marcos signed the proclamation on September 17 or on September 22—but, in either case, the document itself was dated September 21. Throughout the Martial Law period, Marcos built up the cult of September 21, proclaiming it as National Thanksgiving Day by virtue of Proclamation No. 1180 s. 1973 to memorialize the date as the foundation day of his New Society. The propaganda effort was so successful that up to the present, many Filipinos—particularly those who did not live through the events of September 23, 1972—labor under the misapprehension that martial law was proclaimed on September 21, 1972. It was not. The facts are clear. A week before the actual declaration of Martial Law, a number of people had already received information that Marcos had drawn up a plan to completely take over the government and gain absolute rule. Senator Benigno S. Aquino Jr., during a September 13, 1972 privilege speech, exposed what was known as “Oplan Sagittarius.” The Senator said he had received a top-secret military plan given by Marcos himself to place Metro Manila and outlying areas under the control of the Philippine Constabulary as a prelude to Martial Law. Marcos was going to use a series of bombings in Metro Manila, including the 1971 Plaza Miranda bombing, as a justification for his takeover and subsequent authoritarian rule. In his own diary, Marcos wrote on September 14, 1972 that he informed the military that he would proceed with proclaiming Martial Law. Even the U.S. Embassy in Manila knew as early as September 17, 1972 about Marcos’ plan. One of my favorite mental exercises, which others may find useful, is to foresee possible problems one may have to face in the future and to determine what solutions can possibly be made to meet these problems. For instance, if I were suddenly asked, to pose a given situation, to decide in five minutes when and where to suspend the privilege of the writ of habeas corpus, I have decided that there should be at least five questions that I would ask, and depending on the answers to these five questions, I would know when and where to suspend the privilege of the writ of habeas corpus. The same thing is true with the declaration of martial law […] It is a useful mental exercise to meet a problem before it happens. By the end of January 1970, Enrile, with the help of Efren Plana and Minerva Gonzaga Reyes, submitted the only copy of the confidential report on the legal nature and extent of Martial Law to Marcos. A week later, Marcos summoned Enrile and instructed him to prepare the documents to implement Martial Law in the Philippines. In his January 1971 diary entries, Marcos discussed how he met with business leaders, intellectuals from the University of the Philippines, and the military to lay the groundwork that extreme measures would be needed in the future. On May 8, 1972, Marcos confided in his diary that he had instructed the military to update its plans, including the list of personalities to be arrested, and had met with Enrile to finalize the legal paperwork required. On August 1, 1972, Marcos met with Enrile and a few of his most trusted military commanders to discuss tentative dates for the declaration of Martial Law—to fall within the next two months. All of the dates they considered either ended in seven or were divisible by seven, as Marcos considered seven his lucky number. On September 21, 1972, democracy was still functioning in the Philippines. Senator Benigno S. Aquino Jr. was still able to deliver a privilege speech—what would be his final one—in the Senate. Primitivo Mijares, among others, recounted the functioning of the House of Representatives and the Senate, with committee meetings scheduled for that night. Senate and House leaders agreed not to adjourn on this day, as earlier scheduled. They decided to extend their special session to a sine die adjournment on September 23. That afternoon, a protest march in Plaza Miranda was sponsored by the Concerned Christians for Civil Liberties. The rally was attended by more than 30 “civic, religious, labor, student, and activist groups […] [and] a crowd of 30,000,” and received coverage from newspapers, radio, and television. In his diary, Marcos wrote that he, together with members of his Cabinet and staff, finished the preparation of Proclamation 1081 at 8 PM, September 21. 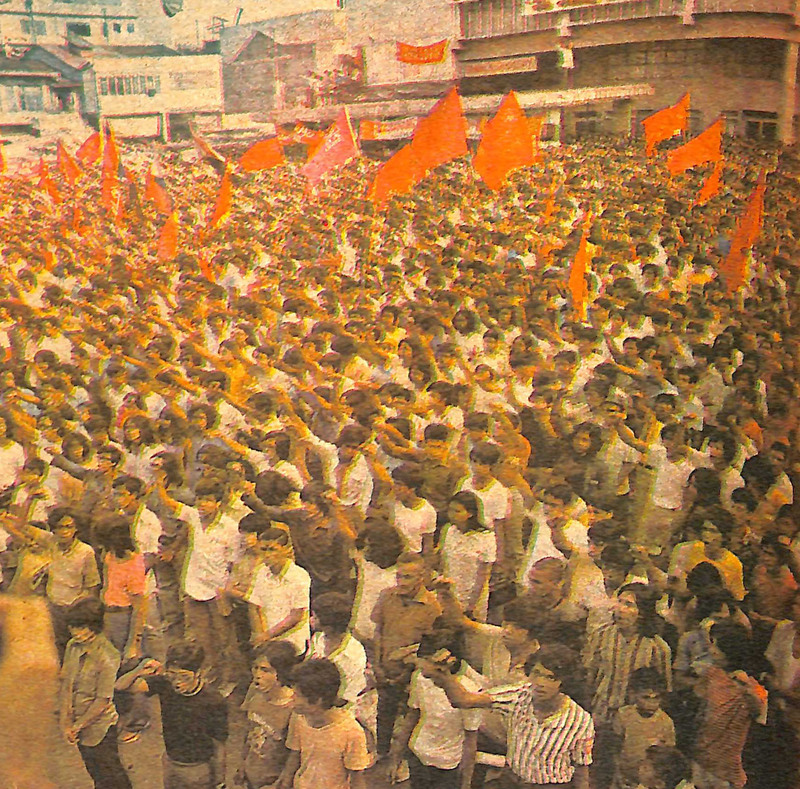 On September 22, 1972, a day after the final speech of Ninoy Aquino, newspapers still came out: they featured the rally held the previous day in Plaza Miranda. Mijares recounted that Marcos was agitated by a statement reported in the Daily Express that if Martial Law were declared, Aquino said he would have to be arrested soon after or he would escape to join the resistance. The pretext for Martial Law was provided later in the evening of Friday, September 22, 1972, the convoy of Secretary of Defense Juan Ponce Enrile was ambushed in Wack-Wack as he was on his way home to Dasmariñas Village in Makati before 9 p.m. Enrile recalled his convoy was driving out of Camp Aguinaldo when a car opened fire at his convoy and sped away. This ambush, as Enrile later revealed in 1986, was staged by Marcos to justify Martial Law. Marcos, in his diary entry for September 22, 1972 (time-stamped 9:55 p.m.) wrote, “Sec. Juan Ponce Enrile was ambushed near Wack-Wack at about 8:00 pm tonight. It was a good thing he was riding in his security car as a protective measure… This makes the martial law proclamation a necessity.” His diary entry for September 25, 1972 mentions conditions after two days of Martial Law, also indicating martial law in reality is dated to September 23, 1972. Primitivo Mijares—a former journalist for Marcos who would later write against Marcos and disappear without a trace in 1973—claimed that the Enrile ambush was fake as it was made as the final excuse for Marcos to declare Martial Law. Mijares also claimed that the ammunition planted by the Presidential Guard Battalion in Digoyo Point, Isabela—which was later confiscated by the Philippine Constabulary on July 5, 1972—was used to connect the ambush with alleged Communist terror attacks. September 21 or September 23? When Marcos appeared on television at 7:15 p.m. on September 23, 1972 to announce that he had placed the “entire Philippines under Martial Law” by virtue of Proclamation No. 1081, he framed his announcement in legalistic terms that were untrue. This helped camouflage the true nature of his act to this day: it was nothing less than a self-coup. Marcos announced that he had placed the entire country under Martial Law as of 9 p.m. on September 22, 1972 via a proclamation which, he claimed, he’d signed on September 21, 1972. Yet accounts differ. David Rosenberg, writing in the Bulletin of Concerned Asian Scholars (“The End of the Freest Press in the World,” Vol. 5, 1973) chronicled that about six hours after the ambush, Marcos signed Proclamation No. 1081, placing the entire country under Martial Law, placing the signing at around 3 a.m. on September 23. Raymond Bonner, in his book Waltzing with the Dictator, narrated his interview with Enrile, during which the former Defense Secretary recalled that he and Acting Executive Secretary Roberto Reyes witnessed Marcos sign Proclamation No. 1081 in the morning of September 23, 1972. The Bangkok Post asserted in a series of articles called “The Aquino Papers,” published from February 20 to 22 of 1973, that Proclamation No. 1081 had been signed even earlier, on September 17, 1972, postdated to September 21. Mijares also mentioned in his book that Marcos said as much in an address to a conference of historians, in January 1973. Two things emerge: first, whether they conflict or not, all accounts indicate that Marcos’ obsession with numerology (particularly the number seven) necessitated that Proclamation No. 1081 be officially signed on a date that was divisible by seven. Thus, September 21, 1972 became the official date that Martial Law was established and the day that the Marcos dictatorship began. This also allowed Marcos to control history on his own terms. The second is that the arbitrary date emphasizes that the actual date for Martial Law was not the numerologically-auspicious (for Marcos) 21st, but rather, the moment that Martial Law was put into full effect, which was after the nationwide address of Ferdinand Marcos as far as the nation was concerned: September 23, 1972. By then, personalities considered threats to Marcos (Senators Benigno S. Aquino Jr., Jose Diokno, Francisco Rodrigo and Ramon Mitra Jr., and members of the media such as Joaquin Roces, Teodoro Locsin Sr., Maximo Soliven and Amando Doronila) had already been rounded up, starting with the arrest of Senator Aquino at midnight on September 22, and going into the early morning hours of September 23, when 100 of the 400 personalities targeted for arrest were already detained in Camp Crame by 4 a.m. In the meantime, the military had shut down mass media, flights were canceled, and incoming overseas calls were prohibited. Press Secretary Francisco Tatad went on air at 3 p.m. of September 23 to read the text of Proclamation No. 1081. The reading of the proclamation was followed by Marcos going on air at 7:15 p.m. to justify the massive clampdown of democratic institutions in the country. Marcos would subsequently issue General Order No. 1, s. 1972, transferring all powers to the President who was to rule by decree. The New York Times reported about these events in an article titled “Mass Arrests and Curfew Announced in Philippines; Mass Arrests Ordered in Philippines” in their September 24, 1972 issue. 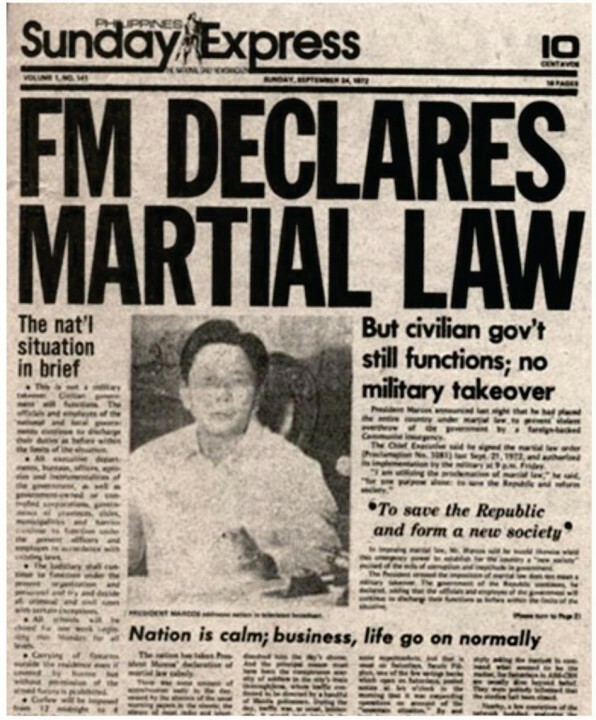 The Daily Express itself announced in its September 24 issue that Marcos had proclaimed martial law the day before, September 23, 1972. After the declaration and imposition of Martial Law, citizens would still go on to challenge the constitutionality of Proclamation No. 1081. Those arrested filed petitions for habeas corpus with the Supreme Court. But Marcos, who had originally announced that Martial Law would not supersede the 1935 Constitution, engineered the replacement of the constitution with a new one. On March 31, 1973, the Supreme Court issued its final decision in Javellana v. Executive Secretary, which essentially validated the 1973 Constitution. This would be the final legitimizing decision with on the constitutionality of Martial Law: in G.R. No. L-35546 September 17, 1974, the Supreme Court dismissed petitions for habeas corpus by ruling that Martial Law was a political question beyond the jurisdiction of the court; and that, furthermore, the court had already deemed the 1973 Constitution in full force and effect, replacing the 1935 Constitution. Martial Law would officially end on January 17, 1981 with Proclamation No. 2045. Marcos, however, would reserve decree-making powers for himself. Within forty-eight hours from the proclamation of martial law or the suspension of the privilege of the writ of habeas corpus, the President shall submit a report in person or in writing to the Congress. The Congress, voting jointly, by a vote of at least a majority of all its Members in regular or special session, may revoke such proclamation or suspension, which revocation shall not be set aside by the President. Upon the initiative of the President, the Congress may, in the same manner, extend such proclamation or suspension for a period to be determined by the Congress, if the invasion or rebellion shall persist and public safety requires it. The Congress, if not in session, shall, within twenty-four hours following such proclamation or suspension, convene in accordance with its rules without any need of a call.